London Fire Brigade Instructional Map. / Bartholomew's Plan of London. An enormously proportioned and extremely unusual map of London, England prepared by John Bartholomew. 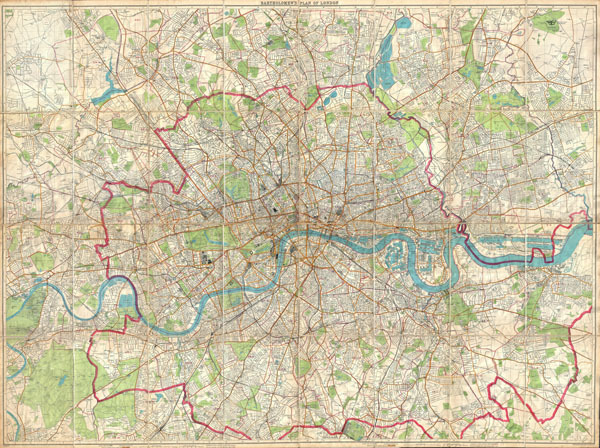 Covers the entire city of London from Kenton in the northwest, to Richmond Park in the southwest, to Hospital Hill in the northeast and Longlands in the southeast. Offers extraordinary detail freely labeling individual buildings, streets, and waterways throughout London. Prepared as a 'London Fire Brigade Instructional Map' with the area of London patrolled by the fire brigades outlined in red. Probably not originally a fire brigade map, but adopted by the fire brigade commanders from Bartholomew's Plan of London, the best available at the time. Undated, but fits with the style and layout of the late 19th century. A rare and magnificent piece of London history. The Bartholomew Family (fl. c. 1810 - 1920) is clan of map publishers active in London through the 19th century. They represent one of the great names in British cartography. The cartographic story of the Bartholomew family begins with George Bartholomew (January, 8 1784 - October 23, 1871, active from 1797), an engraver in the employ of the Daniel Lizars firm of Edinburgh. George was the first of six generations in the Bartholomew map-making dynasty. It was his son, John Bartholomew Sr. (1805 - April 9, 1861) who ultimately founded John Bartholomew and Sons in 1828. The John Bartholomew firm produced thousands of maps and rose to become one of the largest and most prolific cartography firms in Scotland. John Sr. was succeeded by his son, also John Bartholomew Jr. (1831-93). John George Bartholomew (1860-1920), son of John Bartholomew (1831-93) took control of the firm at its height. John George was a charter member of the Royal Scottish Geographical Society and supported the creation of a National Institute of Geography - a good idea that never took off. John George is also reliably attributed to be the first to bring the term "Antarctica" into popular usage as a denominator for the Southern Continent. In recognition of his work, John George was awarded a warrant from the king and often used the title "Cartographer to the King" on his imprint. Among his friends and admirers he was referred to as the "Prince of Cartography". Today the John Bartholomew firm has been absorbed into the HarperCollins family of publishers. The vast archive of maps and atlases produced by the Bartholomew family has since been transferred to the National Library of Scotland where it is currently in the cataloguing process. Very good condition. Dissected and mounted on linen in 32 sections. Original linen backing in good condition. Comes with original red linen folder stamped with title 'London Fire Brigade Instructional Map'.